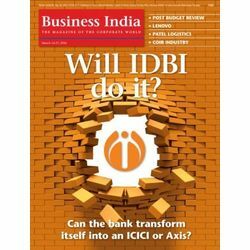 •BUSINESS INDIA is India's first and foremost business magazine. Launched in February 1978, this business fortnightly pioneered the market for business journalism, in India. Through the years, despite new entrants in the field, BUSINESS INDIA enjoys the enviable reputation of being India's most respected and credible business magazine. •CUTTING EDGE business news and analysis LIKE NO OTHER. No wonder, successful businessmen have been inspired by it for 900 issues! •BUSINESS INDIA is India's first and foremost business magazine. Launched in February 1978, this business fortnightly pioneered the market for business journalism, in India. Through the years, despite new entrants in the field, BUSINESS INDIA enjoys the enviable reputation of being India's most respected and credible business magazine. •CUTTING EDGE business news and analysis LIKE NO OTHER. No wonder, successful businessmen have been inspired by it for 900 issues!